A purple sea urchin (Strongylocentrotus purpuratus) sits in a hole in the rock it has carved for itself. Sea urchins, the living pin cushions of the sea, seem to be able to bore into solid rock to make homes for themselves. Recently published research from Villanova University has conclusively shown that not only can they excavate crevices in rock, but they can do it in a matter of months. A coralline sculpin (Artedius corallinus), a tiny predator on California reefs, peers out from atop its rocky perch. Rocky reefs off the Pacific coast of North America are home to a myriad of predators, ranging in size from great white sharks to tiny snails and other very small creatures that hunt other living organisms for sustenance. At the smaller end of the scale among the fish species is the coralline sculpin (Artedius corallinus), an often brightly-colored denizen of the reef. In spite of their bright colors they are often difficult to spot, being a case of hiding in plain sight. Belonging to the family Cottidae, or cottids for short, coralline sculpin are typically dark grey to brown on the back with purplish-red mottling on the head and back. These bright colors can be seen in today’s photo. The term coralline in this case is a reference to coralline algae that are most typically pink, a color that can be seen most clearly just to the right of the eye on the gill cover. With the almost psychedelic color patterns, and a propensity for hiding among various red algae, these tiny predators, no more that 5.5 inches (14 cm) can pretty much hide in plain sight, waiting for prey to swim by, while simultaneously avoiding predators. Today’s photo was taken at Talcott Shoals off Santa Rosa Island in Channel Islands National Park with a Canon EF100 mm f/2.8 Macro USM lens with Canon EF12 II and Canon EF25 II extension tubes on a Canon EOS 5D Mk III in an Ikelite underwater housing. Lighting was provided by an Ikelite DS-161 strobe set to eTTL metering. The exposure was set to 1/60 sec at f/9.5 and ISO 400. Staring down the exhalant siphon of a fluted giant clam (Tridacna squamosa). Are clams happy? It’s an age-old saying, but how would one determine the mental state of a clam? Needless to say, there probably isn’t a way to determine the happiness of clam, or even if they have anything we’d call a mental state. But life for a clam may not be all that bad. Clams are classified in the same large group of animals with snails, slugs, and octopus, squid, and cuttlefish. Pretty diverse group, huh? All these species belong to the group known as Mollusca, the mollusks, a group for which the major relationships between the various subgroups have yet to be worked out. About the only characteristic of mollusks upon which there is more or less uniform agreement is that they all have soft, unsegmented bodies, usually with a “head” and “foot” region. Beyond that, some have hard exoskeletons like the shells of snails or clams, but other don’t. Today’s photo is of the famous, or perhaps infamous, giant clam. This particular species is the fluted giant clam (Tridacna squamosa). The genus Tridacna includes the largest of the organisms known as bivalves, or those species who live within a pair for hinged shells, like clams and mussels. In spite of being thought of as deadly organisms capable of closing down on an unwary human snorkeler and holding them underwater until they drown, these clams actually close their twin shells quite slowly. You’d have to purposefully hold your foot or hand in place for quite a few seconds before the shells might begin to pinch closed on you. Like all other clams and mussels, the giant clam is a filter feeder. They draw in seawater through one opening in the body, pass it along their gills where small organisms are strained out, and then pass it out through a tube-like siphon. In the fluted giant clam, all the patterned flesh that you see between the shells in the photo is part of the mantle. The patterns of sometimes bright colors on the giant clams is the result of the presence of single-celled marine algae in the tissue that photosynthesizes in the sunlight, passing along some of the material they create to the clam. In addition to the algae, known as zooxanthellae (zōəzanˈTHelə), the mantle contains other colored compounds that act as sunglasses, shading the algae from harmful UV radiation. So, having the ability to filter their own food from the water, plus harboring a host of algae making food for them, it is probably safe to say that clams lead a pretty happy existence. Today’s photo was taken on Rainbow Reef off Vanua Levu in the Republic of Fiji. It was taken with a Canon EF100 mm f/2.8 Macro USM lens on a Canon EOS 5D Mk. III in an Ikelite underwater housing. Lighting was provided by two Ikelite DS161 strobes in eTTL mode. The exposure was set at 1/60 sec. at f/16 and ISO 1600. Humann, P., and DeLoach, N. (2010). Reef Creature Identification Tropical Pacific. Jacksonville, FL: New World Publication, Inc.
A delicate marine organism waves in the gentle ocean current. Many marine animals species look more like plants than animals. Ostrich plume hydroids are an example of this. Related to sea anemones and sea jellies, these tiny animals have stinging cells too. Unlike anemones and jellies, hydroids tend to be colonial. A garibaldi (Hypsypops rubicundis) swims in a giant kelp forest on Anacapa Island, off the California coast. Forests of giant kelp can be found in temperature waters around the globe in the southern hemisphere, but are unique to the west coast of North America in the northern hemisphere. 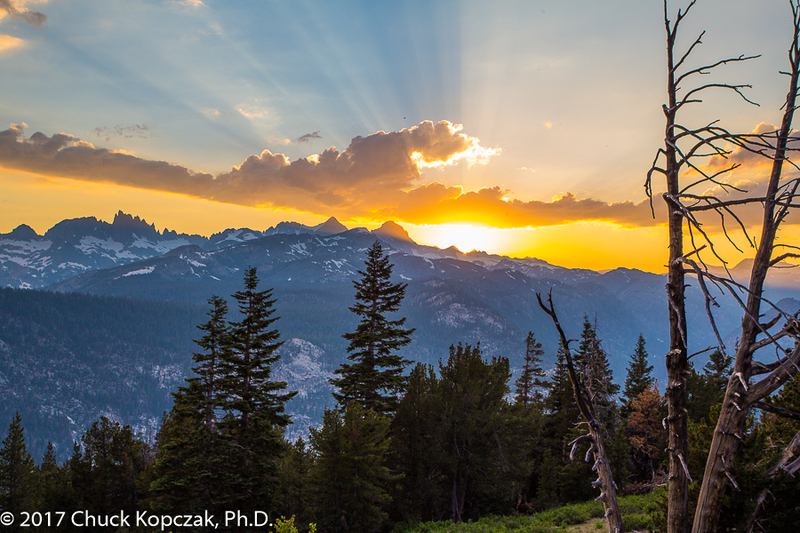 Early morning light on the eastern face of the Sierra Nevada range in California. California was assembled by the successive collisions of the future North American continent with island arcs formed by tectonic activity. An enormous slab of granite beneath the surface was formed when molten rock (magma) produced by the Farallon plate sliding under the North American plate rose toward the surface. This granite is today exposed as the Sierra Nevada range in California. Sunset beyond the Minarets and Mt. Ritter in the eastern Sierra Nevada mountains. As we reach the end of another year, we see the sun set on 2017, but this photo also presents a couple of scientific phenomena. Sunset over Horseshoe Lake in the Eastern Sierra Nevada Mountains. A dramatic sunset over Horseshoe Lake near Mammoth Mountain in California's eastern Sierra Nevada Mountains is the result of sunlight being selectively absorbed and scattered as it passes through the atmosphere. Physics made visible. The norther end of the Mammoth Crest is reflected in the still waters of Horseshoe Lake in the Mammoth Lakes Basin, California. The area surrounding Mammoth Mountain in the Eastern Sierra Nevada mountains of California was shaped by both fire and ice. While the action of the ice stopped about 12,000 years ago, the activity of fire continues to this day. 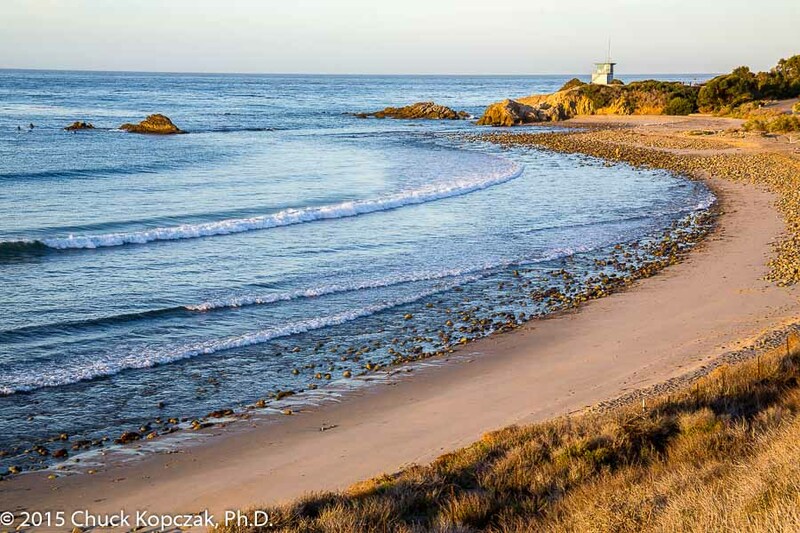 Waves approaching the beach at Leo Carrillo State Beach form an arc that nearly perfectly matches the shape of the beach. Starting as swell on the surface of the ocean far at sea, energy transferred to the water by wind moves in all directions. As swell gets closer to shorelines it begins to encounter the bottom and form into a wave that breaks on the beach. Differences in the depth along a beach causes the waves to change direction to match the shape of the beach. Pineapple coral, possibly in the genus Favites, on Rainbow Reef off Vanu Levu, Republic of Fiji. Reef-building corals are a partnership of an animal and single-celled algae that form a partnership capable of forming structures of biological origin that can be seen from space. The animal harbors the algae in its tissue, providing protection and a source of fertilizer for the photosynthetic algae. The algae reciprocate by sharing excess materials produced by photosyntesis. A cluster of tunic-band tunicates (Euherdmania claviformis) at Willows West Wall on Santa Cruz Island. The odd-looking creatures in today’s photo are known as tunicates, an exclusively marine group of animals that take many forms. A continental divide is boundary or ridge that separates a continent’s river systems. River systems on opposite sides of the divide will feed into a distinct ocean basin or sea. Every continent on Earth, except Antarctica, has a continental divide, and sometimes more than one. Leaves and early-stage fruit of the lemonade berry bush (Rhus intergrifolia). Lemonade berry (Rhus intergrifolia) is an endemic plant species in the California Floristic Province. It gets its common name from the sharp, tart taste of its berries. Native American people used the berries and leaves in several ways. One included soaking the berries in water to create a tart beverage. The Vasquez Rocks in northern Los Angeles County are the result of the erosion of the San Gabriel Mountains and subsequent uplift and erosion along smaller fault systems. The angle of tilt on the layers of sedimentary rock exposed in this formation is a testament to forces involved in the process of mountain building when two of the Earth's tectonic plates grind against each other. A Norris's top snail (Norrisia norrisi) crawls across the bottom. Marine snails start off life as microscopic larvae that bear very little resemblance to their final form. 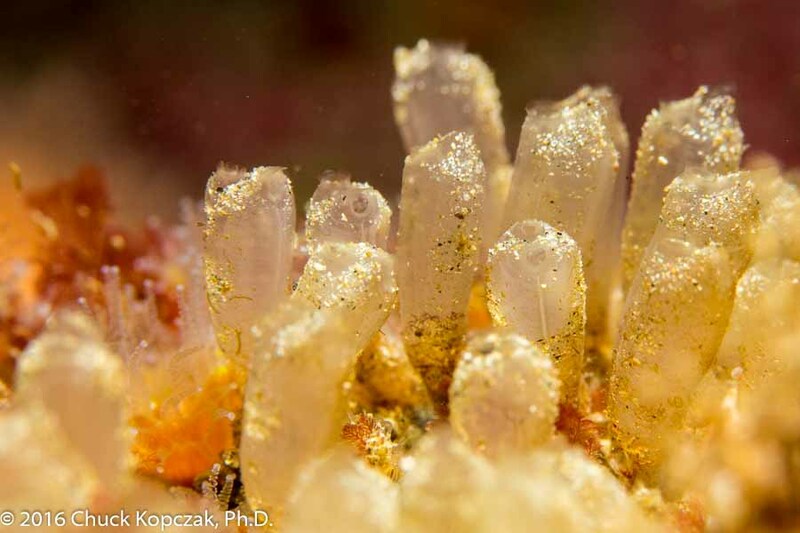 They also have a microscopic shell that must have some way of growing along with them as they develop into an adult. How does a snail manage to make a shell made of limestone grow? Snow collects in the nooks and crannies of a decaying tree in late December 2016. California has been in a significant drought over the last five or six years. But the state also gets abundant rainfall over multiple years at other times. California's Mediterranean climate is a study in contrasts when it comes to annual rain totals. A Loch's chromodoris nudibranch (Chromodoris lochi) at Coral Garden off Taveuni, Republic of Fiji. This blue and white nudibranch is Loch's chromodoris, and was photographed at Coral Garden off Taveuni in the Republic of Fiji. Like other nudibranchs and sea hares, it is a simultaneous hermaphrodite, possessing both male and female reproductive structures at the same time. The red sea urchin (Strongylocentrotus franciscanus) is the largest of the sea urchin species found along the coast of California. 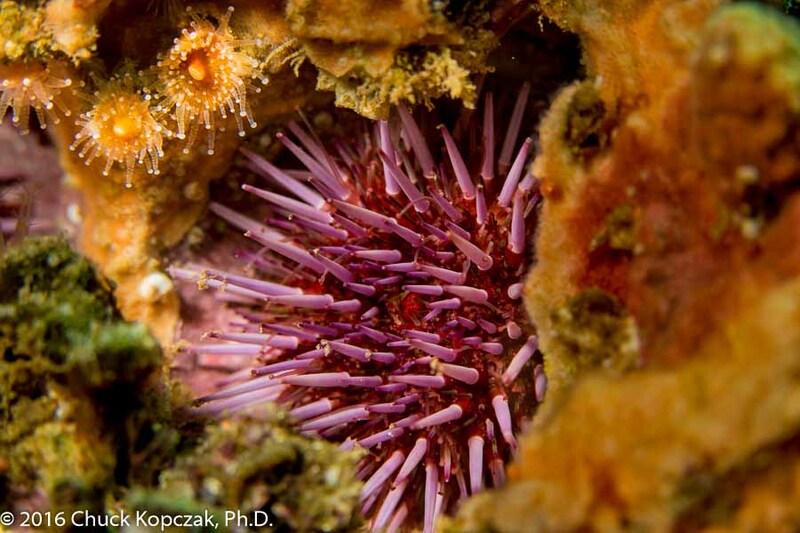 Sea urchins use a coat of sharp spines as a defensive strategy. Related to sea stars, sea cucumbers and sand dollars, urchins have the most obvious spines, but all members of this group of animals have some sort of hardened plates embedded in their skin for protection, and to give them shape. A black-crowned night heron (Nycticorax nycticorax) with breeding plume. The black-crowned night heron (Nycticorax nycticorax) is the most widespread species of heron in the world, occupying habitats in North and South America, parts of Africa and Asia. Habitat loss and pesticides have reduced their total numbers worldwide. While appearing rather stocky and languid during the day, the beautiful grey and blue-black plumage is quite striking.